This dishcloth is entirely crocheted, but at first glance, it looks like knitting and crocheting combined. The body of the dishcloth is worked using Tunisian knit stitch, a crochet stitch that, from the front of the work, looks just knitted stockinette stitch. My dishcloth turned out really hefty and absorbent; it holds more fluid than any of my others do. When something liquid spills, it's the first thing I reach for to mop up the mess. This dishcloth is easy enough for a determined beginner to crochet, although the Tunisian knit stitch isn't typically the first stitch a beginner would learn. It's also a fast no-brainer project that a crocheter of any skill level could enjoy. You'll need a Tunisian crochet hook / afghan crochet hook in size J. 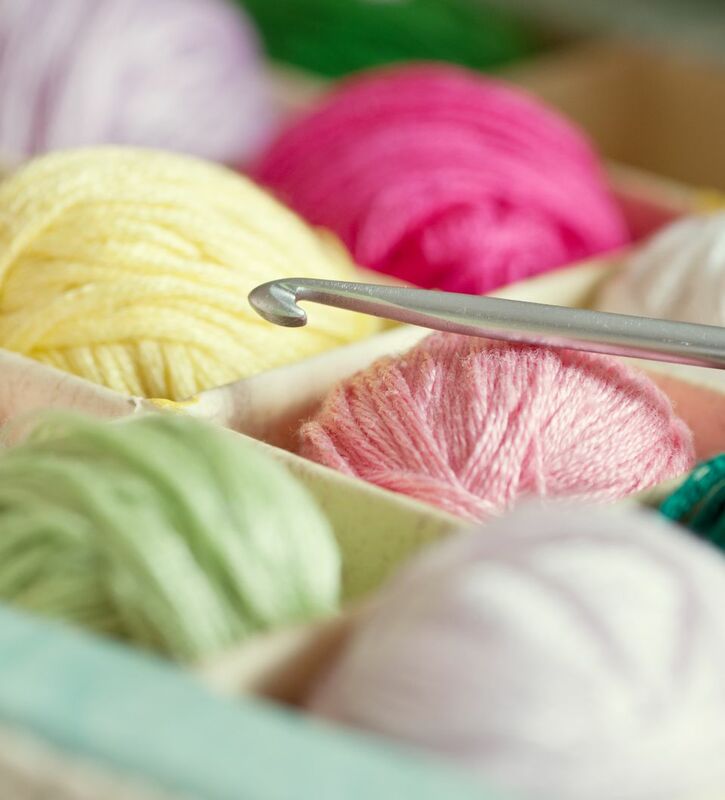 To accommodate the necessary number of stitches, you'll want to use a hook that measures at least 10 inches long. Stitch gauge = 4 Tunisian knit stitches per inch. Row gauge is not critical for this project. The finished dishcloth measures approximately 8.5 inches square, including the edging. Before adding the edging, the piece of Tunisian knit stitch alone measures approximately 6.5 inches square. Ch 26. Work a square in Tunisian knit stitch. When you crochet the first row, be sure to work into the backs of the chain stitches. If you have no idea what this means, see the photos and instructions on this page. After the square is complete, work 1 sl st into the vertical bar of each stitch across. You'll end up with a total of 25 sl sts. Do not turn. Dishcloth Edging Round 1: Continue working with rs facing. Working in single crochet, make 26 evenly spaced sc sts down the side of the dishcloth. (This will be the left side if you're right-handed, and it will probably be the right side if you crochet left-handed.) ch 2 to form the corner, then crochet another 26 evenly spaced sc sts into the remaining free loops of the starting chain, ch 2 for corner, crochet another 26 evenly spaced sc sts up the other side of the piece, ch 2, work 25 sc sts across the top of the piece -- one st in each of the sl sts you worked into the vertical bars. ch 2, join the end of the round to the beginning with a sl st.
Dishcloth Edging Round 2: sc in each st around. When you get to the corners, work 1 sc st into the ch-2 space, ch 2, work another sc st into the same ch 2 space, then continue working sc all the way around. At the end of the round, ch 2, then join the end of the round to the beginning with a sl st.
Repeat row 2 as many times as desired. I worked 3 rounds total, but you can do more rounds if you want to make your dishcloth bigger. If you crochet fewer rounds, the dishcloth may curl up a bit, since Tunisian knit stitch tends to curl. Be sure to check out our other free crochet dishcloth patterns, and our other kitchen patterns.